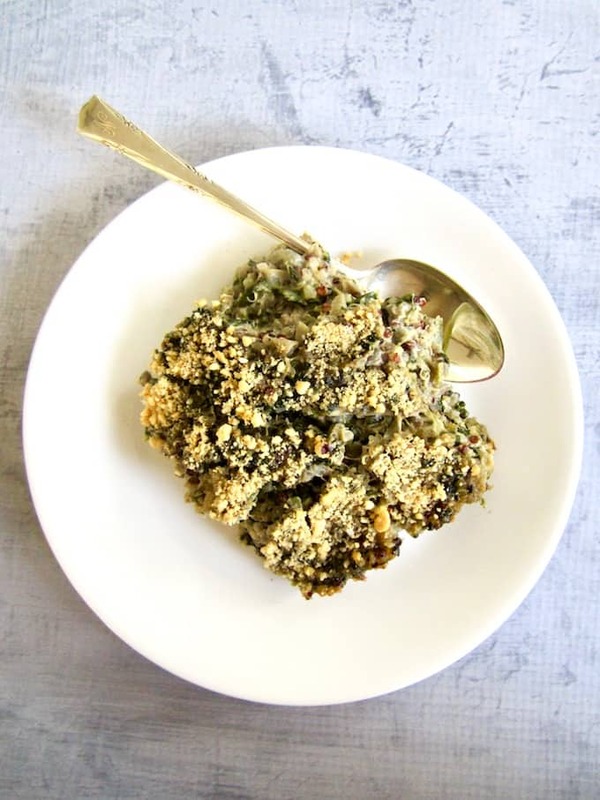 This healthy Spinach Artichoke Quinoa Casserole recipe (gluten free) unites the classic combo of Spinach & Artichoke Dip with an American family favorite meal – the hearty casserole! Using organic truRoots quinoa, this recipe makeover is filled with plant based protein and delivers a vegan dinner that the whole family will enjoy out of the oven or for leftovers the next day. Plus – get 30% off truRoots Quinoa at Target with their Cartwheel app, now through October 7th! Since I was a kid, I’ve loved spinach and artichoke dip. It’s one of those classic dips that never seems to go out of style. It’s been on menus across the country for decades. People always seem to gravitate and circle around it at parties. When I was growing up and we went out to eat as a family, my parents often ordered it as an appetizer and our whole family always loved it (and still does to this day!). The thing is, these classic Spinach & Artichoke Dip recipes are easily disguised as being healthy, but they really aren’t so much. Spinach? Artichokes? See, there are vegetables in there! Yet all the classic versions are laden with some combo of mayonnaise, sour cream, cream cheese and lots of shredded cheeses. 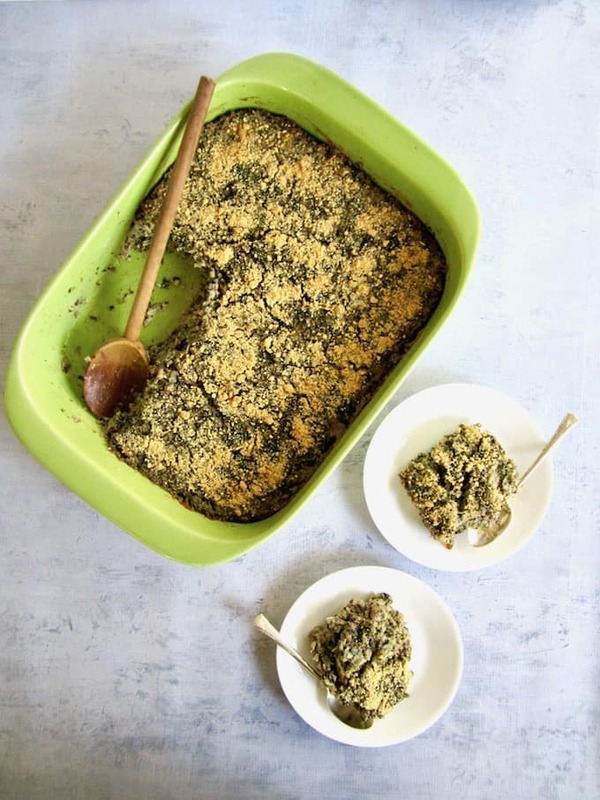 In this recipe makeover, I’ve made a healthy, vegan spin on the classic recipe – combining the iconic spinach and artichoke dip with another American classic – the casserole! What is it about the word ‘casserole’ that immediately evokes images of warmth, comfort and family meals? I suppose because nearly every child in America grows up eating casseroles, that we associate them with family time and satisfying, delicious food. We always ate casseroles as a family growing up, and as an adult I cherish the nights that I get to have around the dinner table with my family eating nourishing food. These days I’m often alone for my meals, and I find it interesting how I seem to enjoy my dinner more when I get to eat with others. Do you notice the same? 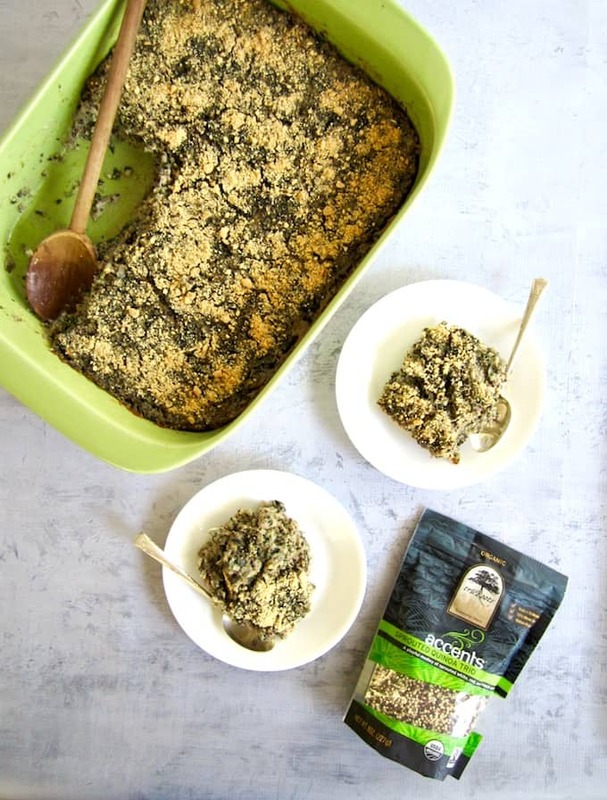 truRoots Quinoa + How to Save Money! As usual, I wanted to make healthy vegan and gluten free recipe inspired by these classic flavors. I had the idea to incorporate quinoa since it’s such a powerhouse, high protein whole grain with delicious flavor that’s quick to cook. I especially love the quinoa medleys that blend white, red and black quinoa together for the added punch of color, texture and taste. I always try to buy organic and sprouted quinoa like truRoots Quinoa that I recently found at Target. To be honest it had been quite some time since I bought food at Target (especially with living abroad for 1.5 years), but I was impressed to see a variety of wholesome products in stock during my recent trip. Are you familiar with Cartwheel, Target’s app? I recently learned about Cartwheel, which is a great way to save money. In the app you can select from hundred of discounts (including the things that you’re probably already buying at Target! ), apply them to your personalized barcode and then simply scan your barcode at checkout and watch the savings add up. You can even use the discounts as many times as you like before they expire, as well as stack on top of your Target REDcard discount and other coupons! I’m definitely taking advantage of Cartwheel before my next trip! In fact, if you shop between now and October 7th, you can get 30% off TruRoots Organic & Sprouted Quinoa – so be sure to go here and get your savings on this wholesome brand before the offer expires! You may have seen in my recipe for this Slow Cooker Pumpkin Quinoa Breakfast Bowl + Vegan Caramel Sauce that, for years, I actually didn’t eat quinoa because I didn’t feel well after eating it. But, I recently realized that when I buy organic (and, when possible, sprouted) – it makes a huge difference! 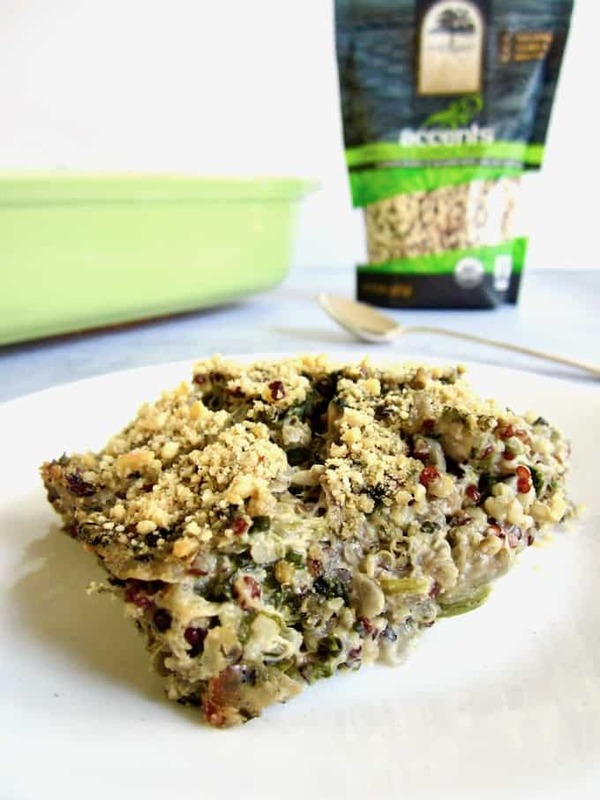 Sprouted grains are seeds that germinate and are eaten before they develop into full-grown plants. Sprouted grains make it easier for your body to absorb nutrients like calcium and iron, while increasing other vitamins in the grain like B vitamins, vitamin C and amino acids. 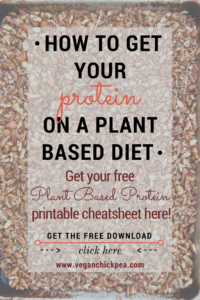 Sprouted grains are also reported to be easier to digest by many. Remember to always rinse the grain under cold water before cooking – sometimes a residue gets left on quinoa, but it rinses off, so take the extra minute to do this! The other key to this recipe is the Vegan Parmesan Cheese and homemade cheese sauce. The cheese sauce, which I first saw on my favorite blog Minimalist Baker, comes from a combo of unsweetened almond milk, cashews, nutritional yeast, olive oil and – of course! – lots of garlic. Then the vegan parmesan is mixed into the sauce, plus into the casserole AND on top for a salty, cheesy flavor. Toss in some chickpeas for extra protein and texture and we’ve got ourselves a nourishing, healthy plant based family meal that the entire family will enjoy together! I loved this recipe leftover, reheated in the oven or even cold (yea, I’m weird like that!). 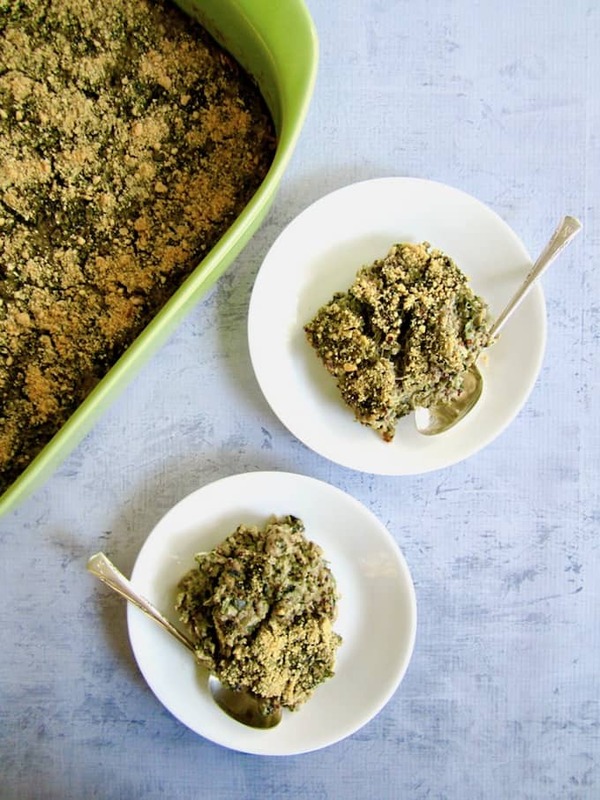 This healthy recipe unites the classic combo of Spinach & Artichoke Dip with an American family favorite – the hearty casserole! Using organic truRoots quinoa, this recipe makeover is filled with plant based protein and delivers a vegan and gluten free meal that the whole family will enjoy out of the oven or for leftovers the next day. Heat a large skillet over med-high heat. Add oil when hot, then the red onion. Saute about 7 minutes, until the onions have softened and are starting to caramelize. Drain excess liquid out of the thawed spinach by squeezing with a dish towel or paper towels. Add the spinach, artichokes and chickpeas to the skillet and cook for 2 - 3 minutes. Stir in the garlic, salt and pepper and remove from the heat. Meanwhile, MAKE THE SAUCE: Heat a separate large skillet over medium heat. Once hot, add oil and minced garlic. Cook for 1-2 minutes, stirring regularly. Once the garlic is light golden brown, add arrowroot starch and whisk for about 1 minute. While continuing to whisk, slowly add the almond milk, and cook for another 2 minutes over medium heat, stirring frequently. The sauce will be a little clumpy. Transfer mixture to a blender, along with the salt, pepper, nutritional yeast, and vegan parmesan cheese. Blend on high until creamy and smooth, scraping down sides as needed. Taste and adjust seasonings as needed (you want it well salted and 'cheesy'). Return sauce back to skillet, warming over low heat until slightly thickened - about 2-3 minutes, whisking occasionally. (If for whatever reason you need to thin it slightly, add more almond milk 1 Tbsp at a time until desired consistency is achieved.) Turn off heat if it starts bubbling vigorously or gets too thick. Combine the sauce with the quinoa and veggie mixture, adding another 1/4 cup of vegan parmesan cheese. Pour into a greased, large baking dish. Top with remaining 1/4 cup vegan parmesan cheese evenly over mixture. *See note for variation. Bake for 30 minutes on middle rack. The edges and top will brown slightly. *VARIATION: Instead of baking the final mixture, you can simply mix the sauce with all the ingredients and serve immediately without baking. This would be creamier and faster. The baking gives it a casserole consistency. (Think of it like the difference between macaroni and cheese off the stove vs. baked macaroni and cheese.) Both are good - just depends on your preference! PREP TIPS: For this meal to easily come together, make the vegan parmesan and cook the quinoa in advance. You could also make the sauce in advance (it will thicken in the fridge so will likely need to be warmed up and thinned out with some additional almond milk prior to mixing with the other ingredients to get creamy again - though I haven't tested this yet). « Easy One Pan Meal: Vegan Mexican Rice Skillet + Simply Organic Sauce Giveaway! Looks great, Sarah! I love truRoots. And it's so cool it's sold at Target! What a healthy and delicious looking casserole. I haven't tried truRoots yet but it sounds awesome. My kind of food! Unfortunately all of our Targets closed across Canada last year though so I wont be buying it there! I'll look out for it elsewhere. Thanks Mel! Ah, that's right. I'm not sure if truRoots is in Canada yet but definitely keep your eyes peeled! That sounds delicious and a perfect dinner solution to keep everyone satisfied! Spinach and artichokes are the best combo! Sounds delicious! lovin this quinoa casserole! All my favorite things, but so much healthier! Spinach and artichokes are a great combo! I eat the dip often. Love that you added quinoa! Thanks! Yes, I love the combo - so classic!